The ICFA report from last Sunday’s ICFA meeting at ICHEP introduces a new panel and summarizes the changes. 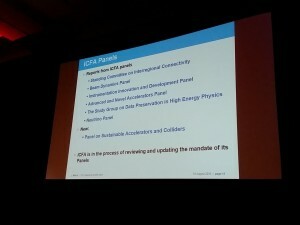 The current Linear Collider Collaboration (LCC) reports to the Linear Collider Board (LCB), which in turns reports to the International Committee for Future Accelerators (ICFA). At previous ICFA meetings the mandate of the current LCC was extended to the end of 2016 and at its February 2016 meeting ICFA formed a committee, consisting of the ICFA chair (Joachim Mnich), the CERN Director General (Fabiola Gianotti), the Fermilab director (Nigel Lockyer) and the KEK Director General (Masanori Yamauchi), to propose a revised structure for the international management of the ILC. ICFA met during the International Conference on High Energy Physics 2016 in Chicago, USA on Sunday 7 August, 2016 and discussed the new structure proposed by the committee. ICFA adopted the revised structure, where the program advisory committee is eliminated, because technical progress is minimal, the LCB remains the same and LCC continues to report to LCB. However the new LCC structure is a bit leaner than the previous structure. There will be a LCC director and three associate directors, one each responsible for the ILC accelerator, the CLIC accelerator and for Physics and Detectors (as before). The concept of the three regional directors (America, Asia and Europe) will not continue and that regional interaction with the new LCC will be assumed by existing structures in the regions. Although not completely defined my assumption is that this will be Asian Committee for Future Accelerator (ACFA) in Asia, European Committee for Future Accelerator (ECFA) in Europe and the America’s Linear Collider Committee (ALCC) in the Americas. As part of this, the term of all members of the current LCC will expire at the end of 2016. ICFA will appoint the new director of the LCC and the new director will appoint the above mentioned three associate directors. Another development in the global activities around the ILC was widely discussed at the European Linear Collider workshop in Santander, Spain, in May 2016 and it was related to the interaction on the ILC between the US and Japanese funding agencies for high energy physics (HEP). Several high level visits between the US and Japan over the last few years resulted in a meeting between the Japanese funding agency (Ministry of Education, Culture, Sports, Science and Technology: MEXT) and the US funding agency (Department of Energy HEP: DOE) to discuss the ILC project. This meeting, which was held about one week before the Santander workshop, started a dialog between MEXT and DOE that will continue with more meetings in the future. As a result of this initial meeting and additional exchanges afterwards there has been a change in support for ILC activities in the US. Up to now funding in the US supported design work on the ILC accelerator project in the areas of facilities design, main linac design, maintaining the machine lattice design, positron source and damping ring development as well as global ILC accelerator management, adding up to about $1.6M/year. A decision was made by DOE HEP to shift the future funding for ILC to support cost reduction efforts with an emphasis on improving superconducting (SRF) cavity performance. This means that currently supported design work on ILC, described above, will continue until the end of 2016 and then end. As a follow up to this DOE HEP has asked Fermilab to develop a plan for improving SRF cavity performance and after a meeting between KEK, Fermilab and DOE HEP this plan is being developed and presumably activities in the US will be supported by DOE HEP. This new direction has been encouraged by the recent work at Fermilab, which has resulted in improved cavity performance in terms of improved quality factor and accelerating gradient, opening the possibility of future cost savings for the ILC. These changes in the US regarding ILC support signal a new direction, which is much more bi-lateral and more directly involve the funding agencies (MEXT and DOE) and the two main HEP laboratories (KEK and Fermilab). In this process DOE HEP also confirmed that the priority for ILC funding in the US remains in the accelerator area and that physics and detector developments have lower priority. It should be noted though that there is the US-Japan Joint Committee for High Energy Physics (see LC Newsline April 2016) and that this committee each year funds common projects in HEP between the two countries. So this remains an option for supporting ILC activities and some detector related projects are already supported from those funds. I would like to end this LC Newsline article on a personal note. It has been an honor for me to be the regional director for the Americas on the LCC for the last few years and work with my colleagues worldwide to advance linear colliders. Things continue to move forward, albeit with a slower pace I than I would prefer, but a positive development for me personally is that this will be my last LC NewsLine article.